NEWS-LEADING DEVELOPMENTS 6 E&MJ • MAY 2018 www.e-mj.com Tara had high grades in the quarter. Wors- ened market terms had a negative impact on earnings within the smelters." Strong production and favorable mar- ket led to a year-on-year improvement in profit for Sweden's largest mining com- pany. Lower milled volumes at Aitik and Kevitsa, and lower zinc grade at Garpen- berg did, however, result in a decrease in profits from previous quarter's levels. These lower volumes were offset by high grades at Aitik and Tara. New information obtained from drilling work in high grade areas at Aitik resulted in the estimated copper grade for the remainder of 2018 being set at 0.26% in an upgrade on the previous estimated figure. 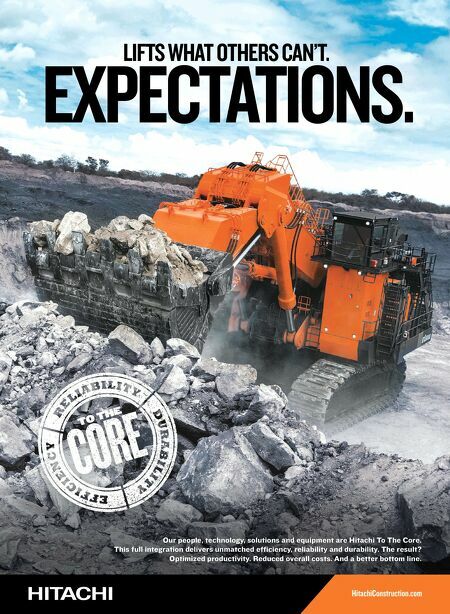 Aitik's new crusher will come on line during the sec- ond quarter. A deterioration in market terms result- ed in a decrease in the company's smelt- ers' profit. The profit was also negatively impacted by SEK 50 million ($6 million) related to a fire at Bergsöe. Copper smelt- er production remained stable. Zinc pro- duction increased at Odda, while produc- tion at Kokkola was negatively affected by an "unfavorable" concentrate mix. 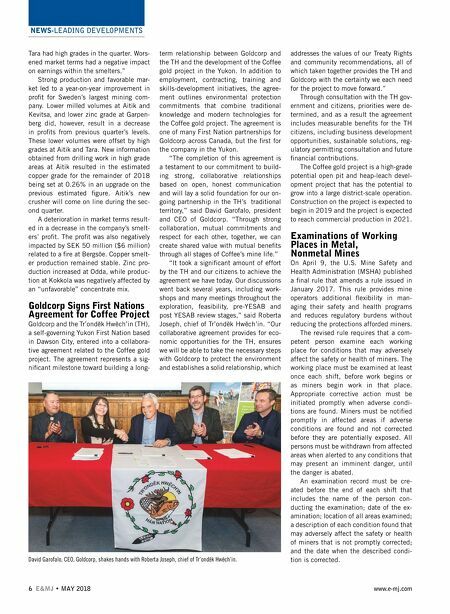 Goldcorp Signs First Nations Agreement for Coffee Project Goldcorp and the Tr'ondëk Hwëch'in (TH), a self-governing Yukon First Nation based in Dawson City, entered into a collabora- tive agreement related to the Coffee gold project. The agreement represents a sig- nificant milestone toward building a long- term relationship between Goldcorp and the TH and the development of the Coffee gold project in the Yukon. In addition to employment, contracting, training and skills-development initiatives, the agree- ment outlines environmental protection commitments that combine traditional knowledge and modern technologies for the Coffee gold project. The agreement is one of many First Nation partnerships for Goldcorp across Canada, but the first for the company in the Yukon. "The completion of this agreement is a testament to our commitment to build- ing strong, collaborative relationships based on open, honest communication and will lay a solid foundation for our on- going partnership in the TH's traditional territory," said David Garofalo, president and CEO of Goldcorp. "Through strong collaboration, mutual commitments and respect for each other, together, we can create shared value with mutual benefits through all stages of Coffee's mine life." "It took a significant amount of effort by the TH and our citizens to achieve the agreement we have today. Our discussions went back several years, including work- shops and many meetings throughout the exploration, feasibility, pre-YESAB and post YESAB review stages," said Roberta Joseph, chief of Tr'ondëk Hwëch'in. "Our collaborative agreement provides for eco- nomic opportunities for the TH, ensures we will be able to take the necessary steps with Goldcorp to protect the environment and establishes a solid relationship, which addresses the values of our Treaty Rights and community recommendations, all of which taken together provides the TH and Goldcorp with the certainty we each need for the project to move forward." Through consultation with the TH gov- ernment and citizens, priorities were de- termined, and as a result the agreement includes measurable benefits for the TH citizens, including business development opportunities, sustainable solutions, reg- ulatory permitting consultation and future financial contributions. The Coffee gold project is a high-grade potential open pit and heap-leach devel- opment project that has the potential to grow into a large district-scale operation. Construction on the project is expected to begin in 2019 and the project is expected to reach commercial production in 2021. Examinations of Working Places in Metal, Nonmetal Mines On April 9, the U.S. Mine Safety and Health Administration (MSHA) published a final rule that amends a rule issued in January 2017. This rule provides mine operators additional flexibility in man- aging their safety and health programs and reduces regulatory burdens without reducing the protections afforded miners. The revised rule requires that a com- petent person examine each working place for conditions that may adversely affect the safety or health of miners. The working place must be examined at least once each shift, before work begins or as miners begin work in that place. Appropriate corrective action must be initiated promptly when adverse condi- tions are found. Miners must be notified promptly in affected areas if adverse conditions are found and not corrected before they are potentially exposed. All persons must be withdrawn from affected areas when alerted to any conditions that may present an imminent danger, until the danger is abated. An examination record must be cre- ated before the end of each shift that includes the name of the person con- ducting the examination; date of the ex- amination; location of all areas examined; a description of each condition found that may adversely affect the safety or health of miners that is not promptly corrected; and the date when the described condi- tion is corrected. David Garofalo, CEO, Goldcorp, shakes hands with Roberta Joseph, chief of Tr'ondëk Hwëch'in.